The South China Sea and East Indies, eastern Mediterranean, Black Sea, North Sea, and British Isles are the most dangerous seas in the world, with the greatest number of shipping accidents in the last 15 years, according to a report released by the World Wildlife Fund (WWF). Scientists from Southhampton Solent University, who led the study, found that cargo vessels account for nearly half of all ships lost at sea, while fishing vessels makes up close to one-quarter. The accidents are linked to weather, ageing and poorly-maintained ships, and a disregard for safety regulations. Environmental risk is also a factor. Some of the most sensitive marine environments are located in hotspot zones for shipwrecks. Oil spills are particularly damaging to ocean and coastal regions. The situation is expected to get worse over the coming decades as global fleet size grows and weather patterns worsen, the report says. Climate change models that show increased storm surge, changing wind and wave patterns, and extreme weather events ”are likely to exacerbate the risks of foundering, defined as sinking due to rough weather, leaks, or damage not due to collision,” the study authors report. 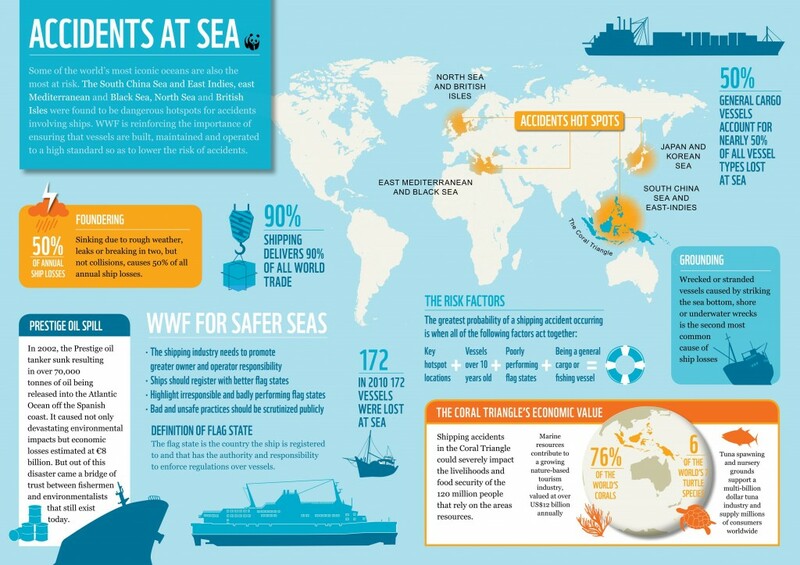 The infographic below shows the number of accidents in the word’s riskiest oceans.